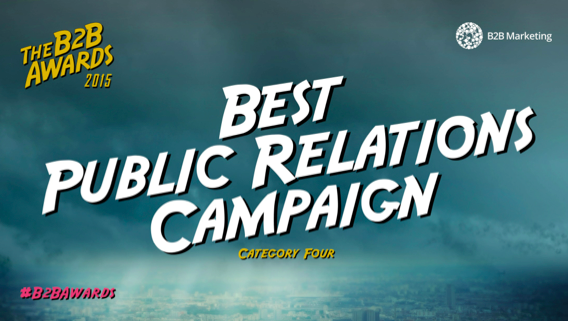 The 5% Club wins ‘Best Public Relation Campaign’ at B2B Marketing Awards! We are delighted to announce that The 5% Club has been crowned B2B Marketing’s ‘Best PR Campaign of the Year’ for all QinetiQ and PHA Media’s hard work in raising awareness of the campaign. The annual award ceremony, which was held this year at the Honourable Artillery Club in Central London, is recognised as the leading B2B awards in the PR and Marketing industry. Since the launch of the campaign, founding company QinetiQ enlisted the help of PHA Media to act as the campaign’s acting press office and raise the profile of the campaign amongst British businesses. As an agency that pride themselves on a journalistic ethos, PHA Media have been prolific in sustaining consistent coverage for the campaign in an integrated campaign across all media channels. As a result of this, the team at PHA have been able to get under the skin of the campaign, the companies involved and, most importantly, the individuals it benefits. Since 2013, the team from QinetiQ with the support of PHA media have together successfully secured commitment from over 134 companies from a huge range of industry sectors. Not only has the campaign helped to address the nationwide need of young people with industry specific skills, but it has helped raise the profile of this issue both amongst employers and recruiters through coverage in national newspapers, broadcast platforms and industry specific publications. Winning this award after consistent, concerted efforts is hugely rewarding both for the team involved at QinetiQ and at PHA media as well as all of the members of the campaign that continue to help the campaign grow and encourage other British businesses to commit to the 5% pledge. While we are incredibly proud, we will use this award to develop the campaign further and hope it will allow us to bring it even greater success. There is still a huge amount to do in order to tackle the skills gap and youth unemployment. It is important that all British businesses start to recognise the potential young people harness and invest in them for the good of their business, young people’s lives and Britain’s future. To find out more information about The 5% Club and how to become a member, please visit www.5percentclub.org.uk or get in touch by emailing contactus@5percentclub.org.uk. Information about the campaign can also be found on Twitter and LinkedIn. Balfour Beatty has today announced that one of its key supply chain partners, A-Plant, has joined The 5% Club. A-Plant is Balfour Beatty’s first supply chain partner to do so. Balfour Beatty recently announced the launch of a dedicated support package for its supply chain partners, in partnership with industry training body the CITB, to support and encourage membership of The 5% Club. The package includes providing advice on how to take up the Shared Apprenticeship scheme, administered by the CITB, (which enables employers to take on apprentices for short periods if they are unable to offer a long term placement), linking its partners to sources of funding provided by the government and dedicated support through its supply chain portal. 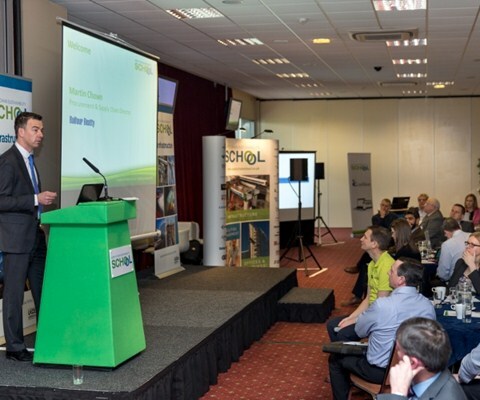 Through its dedicated support, Balfour Beatty is looking to encourage at least fifty of its key supply chain partners to become members of The 5% Club each year. A-Plant is one of Balfour Beatty’s largest suppliers of construction equipment and employs 2,600 people, with around 4% of their workforce currently in an apprenticeship or a formal graduate or sponsored student scheme. Balfour Beatty, one of the early members of The 5% Club, launched 150 new apprenticeships during National Apprenticeship Week earlier this month, and announced its partnership with 12 universities to deliver new Trailblazer Higher and Degree Apprenticeships, through which it is taking on an additional 35 apprentices from September. Balfour Beatty currently has 375 apprentices, 184 graduates and 17 students taking part in college courses, representing just over 3% of its 17,000 strong workforce. To find out more information about The 5% Club and how to become a member, please visit www.5percentclub.org.uk or get in touch by emailing contactus@5percentclub.org.uk. Don’t forget to follow us on Twitter, Facebook and LinkedIn as well! The war for talent: Who’s winning? 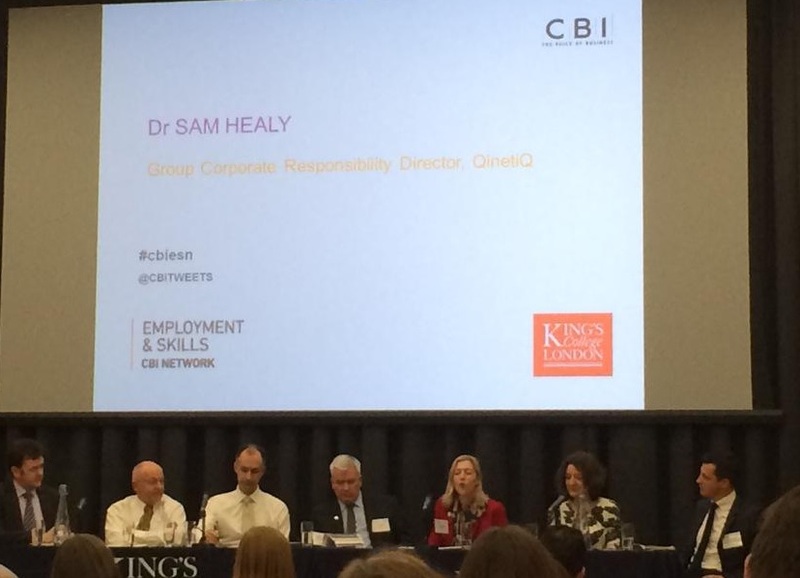 Yesterday, Dr Sam Healy, Programme Director of The 5% Club attended and spoke at the CBI’s ‘War for talent: Who’s winning?’ event at Kings College, London. Sam spoke about businesses’ role in youth unemployment and how it’s so important for businesses to engage with colleges, schools and universities to acquire talented employees. The CBI, who are a member of The 5% Club, chaired the panel and were joined by other 5% club members, Renishaw and KPMG. Peter Bowler, Head of Group Human Resources at Renishaw spoke about the importance of developing engineer’s skills set and how mobility is so important in sourcing good talent. Colm Coffey, HR Director at KPMG gave insight into the company’s experience of social media in recruiting young people. We also heard from John Greatrex, Group HR Director at Unipart, Professor Karen O’Brien, Vice-Principal of Education at King’s College London and Matthew Wragg, Marketing and Sales Director at Matchtech Group plc. Sam shared insight into the benefits of joining The 5% Club, how it is a network of businesses that share talent recruitment challenges within the 16- 25 age bracket and how solutions can be sourced from peer learning. We look forward to the next CBI event and potentially hearing from other companies keen to join the campaign. The National Apprenticeship Service has awarded Dale Power Solutions the ‘The Nuclear Decommissioning Site Licence Companies Medium employer of the Year’ for their apprentice programme. In addition, their apprentice Natasha Pitts won her second ‘Unilever Award for Higher Apprentice of the Year’, making it an exceptional night of celebration at the Yorkshire & Humberside regional apprenticeship awards. The winners were announced at a high-profile awards ceremony organised by the National Apprenticeship Service and held at the iconic Carriage works theatre in Leeds on Wednesday the 3rd September. Dale Power Solutions apprenticeship programme first began in the 1940’s. Since then, the scheme has been recognised nationally as a top 100 UK apprentice employer, their apprentices winning regional and national accolades. They attract many of the nation’s brightest apprentices, answering where the power of apprenticeships could take you. 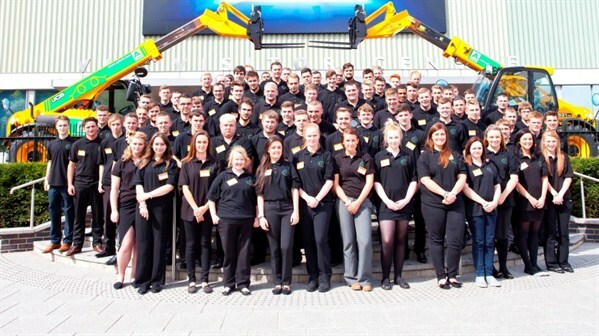 August saw Dale Power Solutions ‘class of 2014’ commence the first year of their 4 year apprenticeship program. The intake of five apprentices includes two female electrical engineering apprentices, demonstrating that engineering is not just for men. This has taken our 5% Club figure to 8.1% (number of apprentices within the workforce), highlighting our commitment to apprenticeships and local communities. Due to the success of the apprenticeship program, Dale Power Solutions are excited to announce that we will be expanding the programme to offer business and administration, including routes into IT, finance and supply chain management. Further recruitment is now underway. Natasha Pitts on winning the Higher Apprentice of the year award: “It is a real Honour to have gained the Higher Apprentice of the Year Award for the Yorkshire and Humber Region two years in a row. Dale Power Solutions have been extremely supportive throughout my apprenticeship. Dale continually provides me with challenges to enable me to progress my career and engineering experiences. My success is thanks to the support of Dale Power Solutions and all my work colleagues who helped me throughout my apprenticeship”. All the Yorkshire and Humberside winners now proceed to a final national judging stage, and have the opportunity to be crowned as the national winner in their category. The Apprenticeship employer entries judged to be the very best of the best will have the additional honour of featuring in the Top 100 Apprenticeship Employers list produced by the National Apprenticeship Service in partnership with City & Guilds, and revealed during the national ceremony on the 13th November at the LG Arena in Birmingham. For more information on Dale Power Solutions apprenticeship scheme please visit the careers section of their website. The 5% Club is proud to be commemorating its first anniversary this week. 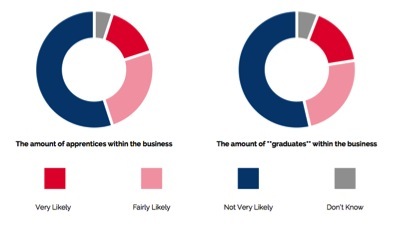 To coincide with the anniversary, we conducted a survey with YouGov that explores small and medium enterprises’ (SMEs) attitudes towards apprentices and graduates. Given the vital role that these kinds of businesses play in sustaining the UK’s economy accounting for 99.9% of private business and employing 14.4 million people, their contribution is essential in tackling the issue of the three quarters of a million young people that are still unemployed, as well as helping to address the nation’s ability to compete globally. Crucially, the survey reveals that 74% of SMEs do believe apprentices and graduates are important to their future, and 40% acknowledge the vital role that they play in upskilling young people. However, many believe there are barriers that prevent them from recruiting young people such as cash flow (30%) and a lack of talent and the appropriate criteria for the job specification (22%). However, many more emphasize a need for a change in communication, in the relationships that SMEs have with young people. 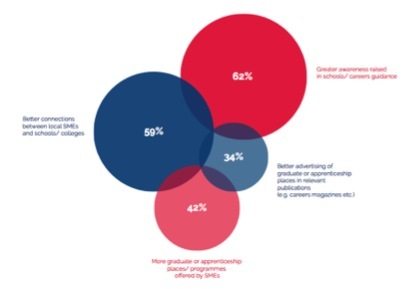 62% suggest that greater awareness needs to be raised in schools and as part of careers guidance, and a further 59% say that they believe better connections between local businesses and schools or colleges would help to increase the amount of young people applying for apprenticeships and graduate training. This is further supported by the fact that 44% of our surveyed SMEs think that young people considering these kinds of training schemes are more interested in those offered by bigger businesses. Alongside the respondent’s understanding that better communication could help encourage young recruits means that there is obviously a certain level of disconnect between young people and SMEs that needs to be addressed. Yet there remains a reluctance to actually become part of the upskilling of young people, with the majority of SMEs admitting that they are not very likely to increase the amount of apprentices or graduates within the next year (74%). The 5% Club believes this is what needs to be addressed in the coming year. As we celebrate twelve months of successful campaigning, our survey with YouGov reveals that there is still much more to be done. Whilst it illumines how valued apprentices and graduates are, as well as how valuable the SME truly is to young people and the British economy, it also demonstrates that our driving force, the need for British businesses to make a difference, is stronger than ever. British businesses, including SMEs need to take action quickly if we’re going to tackle the chronic skills shortage and youth unemployment prevalent in Britain today. If you believe in young people and the SMEs that support our nation then why not join us as we enter our second year in campaigning for the recruitment of the next generation? Join The 5% Club today and commit to the aim of ensuring that 5% of your workforce is made up of apprentices, graduates and sponsored students on structured programmes within the next five years. To find out more information about The 5% Club and how to become a member, please visit http://www.5percentclub.org.uk/index.html or get in touch by emailing contactus@5percentclub.org.uk. 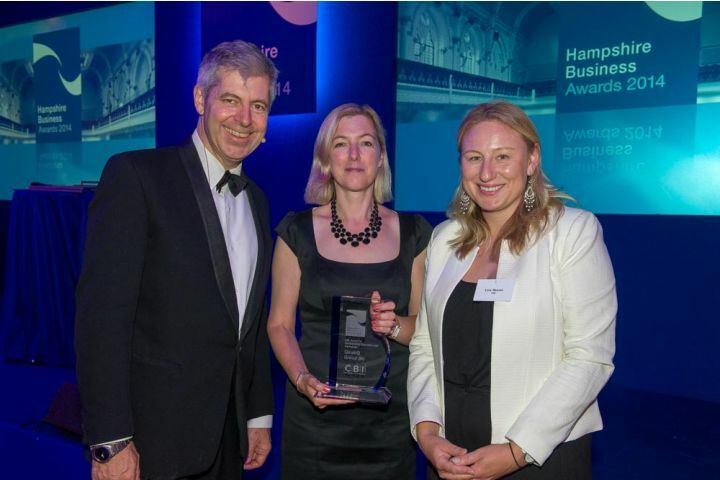 QinetiQ Attend The Hampshire Business Awards 2014. On Tuesday 30th September, Dr Sam Healy, Head of Corporate Responsibility at The 5% Club founding member company, QinetiQ, attended the Hampshire Business Awards 2014. The ceremony, which took place in the grand surroundings of Winchester Guildhall saw some of the best companies in the Hampshire country receive awards for different categories including ‘Management team of the year’, ‘Corporate Responsibility and Sustainability’, ‘Technical Innovation’, ‘Company of the year’ and ‘Outstanding Business Led Campaign’. The awards were supported by RBS, Blake Morgan, University of Southampton, KPMG and CBI and hosted by BBC journalist Justin Webb. QinetiQ won the ‘CBI Special Award for Outstanding Business Led Campaign’ which was presented by Lucy Haynes, CBI Director, Member Relations. To mark the start of National Apprenticeship Week, Leo Quinn, CEO of one of The 5% Club founding members QinetiQ, joined Evan Davis and Simon Jack on the Today programme on BBC Radio 4 this morning. As a new report released by the Department for Business revealed that 44% of employers in the UK plan to take on apprentices in the UK, Quinn praised National Apprenticeship Week and the work of The 5% Club, but called for more action to be taken in order to tackle the UK’s skills shortage. “We look at apprenticeships as apprenticeships for life- what’s happening for the other 51 weeks (of the year). What we want is people to invest in apprenticeships on a long term basis. “The 5% Club is designed for any corporation to make a public declaration that 5% of their employee base will be made up of apprentices or graduates on formal training schemes”. Leo Quinn was joined by QinetiQ apprentice Robert, who spoke of the inspiration that led him to pursue an apprenticeship. “I went into an apprenticeship when youth unemployment was quite high. I decided to go for an apprenticeship because I’d have the hands on skills and ability afterwards to get a job. You need the skills alongside the knowledge”. “Apprentices rejuvenate the employment space. They’re creative, they’re energising, and they value they add far outweighs any cost that they incur”. To follow the progress of The 5% Club, and the activities of our members during National Apprenticeship Week, follow @5percentclubuk and @LeoQuinn_UK.